February 11, 2019, 3:23 PM · In an effort to promote the coverage of live violin performance, Violinist.com each week presents links to reviews of notable concerts and recitals around the world. Bomsori Kim performed the U.S. premiere of Tan Dun's violin concerto, "Fire Ritual" with the New York Philharmonic. New York Times: "...this work is inspired by ancient Chinese rituals that pit two groups of musicians against each other. 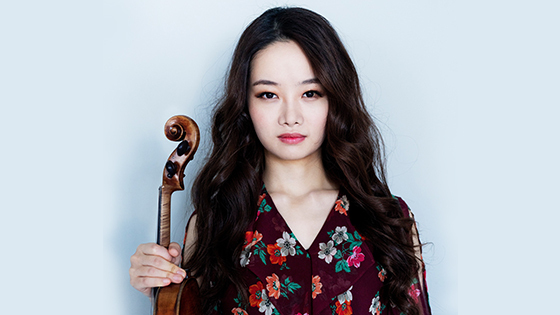 The solo violin — here played with fierce dramatic commitment by Bomsori Kim — takes on a shamanistic role...."
Xinhua North America: "Fire Ritual is deeply influenced by worship music and court music in ancient China, while blending western and modern musical elements. Hand cymbals, resembling those in Peking Opera, were seamlessly merged with a Baroque violin ensemble, and the sound of bird chirping echoed the hymns of human beings, creating dialogue between mankind and nature." Financial Times: "Imitation bird calls, high up in the instrumental registers, also turn up, but the concerto, resolutely grounded in the key of D, comes closest to fulfilling its ritualistic intent in the last of its four sections, dominated by a sombre, expressively flowing theme." Leonidas Kavakos performed in recital with Yuja Wang at Carnegie Hall. The National Herald: "The two gifted musicians brought their tremendous individual talents and virtuosic skills together for a memorable concert that the lucky audience members will never forget." Broadway World: "There is such a rapport between them that an easy flow of ideas and emotions inform all of their performances. It's a perfect pairing." Ray Chen performed Saint Saens' "Introduction and Rondo Capriccioso" and Ravel's "Tzigane" with the Los Angeles Philharmonic. Violinist.com: "This piece is a showcase for schmaltz and precision technique, and Chen had plenty of both. Chen gave the impression of being part rock star and part Paganini, with playing that was in turns theatrical, playful, joyful." Los Angeles Times: "Violinist Ray Chen was the suave soloist in Saint-Saëns and Ravel potboilers. " Ilya Gringolts performed Prokofiev Violin Concerto No. 2 with the Naples Philharmonic. Naples Daily News: "Often the violinist is pitted against the orchestra’s work and it is easy to miss those triplet runs and warp speed phrases. Gringolts flew through all of them cleanly and with strong sense of dynamics, as well as a modest sense of showmanship. Intent on the music, rather than the workout, Gringolts gave a riveting performance." Lisa Batiashvili performed Szymanowski’s Violin Concerto No. 1 with the Boston Symphony. Boston Musical Intelligencer: "Lisa Batiashvili, the soloist, fearlessly projected the concerto’s expressive registers high and low with beautiful tone, though the orchestra sometimes covered her rapid passage work in the lower register." Gil Shaham performed Prokofiev’s Violin Concerto No. 1 with the San Francisco Symphony. Datebook: "Shaham brought a welcome degree of vitality to the Prokofiev concerto, sometimes to the point of goosing Thomas and the orchestra into step with him....The tension that resulted had a dramatic effect, and everyone found their groove more persuasively in the brisk central scherzo, leading to a shimmering, deftly wrought consummation in the finale." Philippe Quint performed "Rêverie et caprice" by Berlioz with the Utah Symphony. Utah Arts Review: "Quint displayed his musicality to the fullest, giving a vibrant account of the opening that captured the dream-like character of the Rêverie, while underscoring the airy, animated spirit of the ensuing caprice."